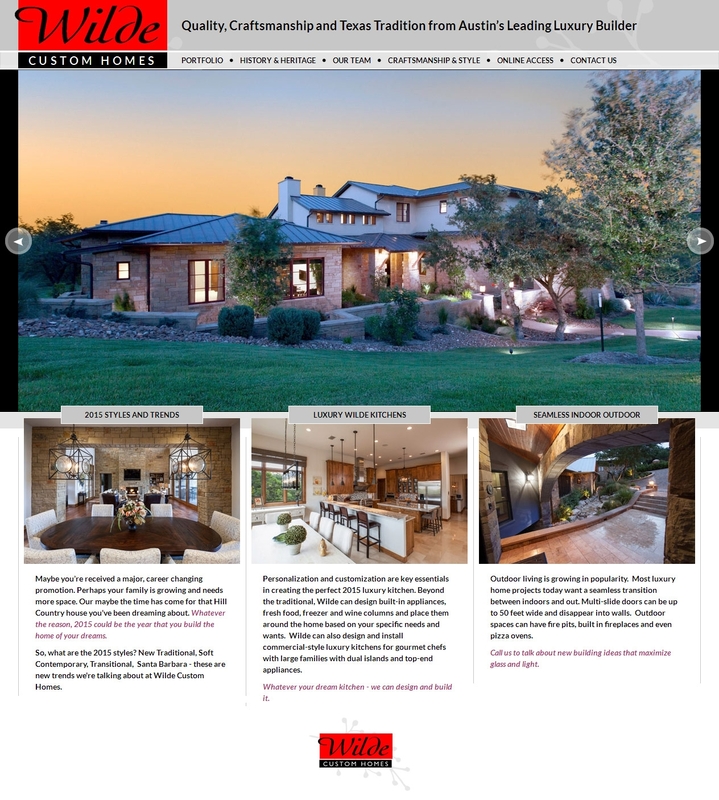 We recently redesigned the Wilde Custom Homes website to showcase the beautiful craftsmanship in every home they build. 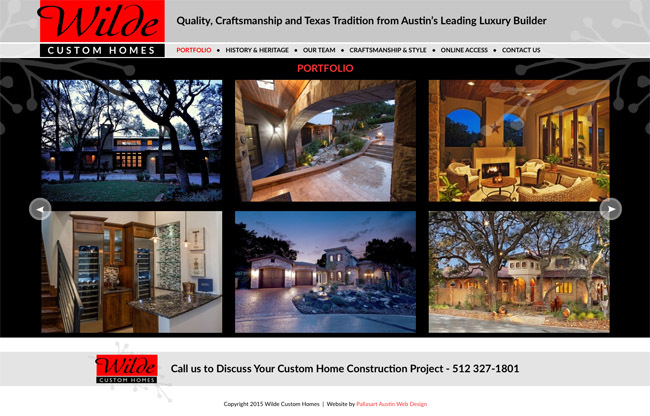 Wilde Homes has been a top custom home builder in Austin, Westlake Hills. Lakeway and surrounding Texas communities for years. They focus on building luxury homes in the $1 to 7 million range. We recently redesigned the Wilde Custom Homes website to showcase the beautiful craftsmanship in every home they build. This was the third design we have done for them over the years that they've been a Pallasart customer. Our goal was to create a site with much larger pictures, a more contemporary design that would fit on smart phones and tablets as well as big monitors. The new site has several slide shows that were especially designed to be be adaptive. There are more than 70 images in the portfolio slide show which appears on the portfolio page and a version of this slideshow also shows at the bottom of the secondary pages. The Wilde logo is strongly red. In selecting the color palette for the site we naturally turned to various tones of neutral gray, black and white - all colors that complement red. These colors also showcase the images. You will see how the black on either side portfolio images and the front page slide show makes them even more rich and vibrant. Pallasart has years of experience designing websites for top home builders across the USA. Give us a call and we can discuss a new website for your company or a refresh of an existing one. We offer superb design and extremely competitive pricing.